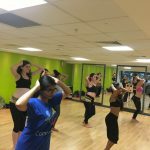 The latest choreography from our 12 week Bellydance Drum Solo course! A great way to keep fit, have fun, burn calories, tone, refine muscles, aid internal health and improve memory and concentration! Too many more health benefits to list!! !